Africa’s biggest-horned and disease-free buffalo was valued at a record amount in a February 2016 auction after businessman Peter Bellingham, of Tambotie Floodplains near Mookgophong bought a 25 percent share in a bull named Horizon for 44 million rand ($2.8 million). That values the animal at a record 176 million rand, surpassing the 40 million rand paid for a buffalo named Mystery by a group including billionaire Johann Rupert in 2013. Horizon’s horns are 55 inches wide, compared with Mystery’s 53 inches. “It was a unique opportunity to own the best genes in the world,” said Hendrik de Kock, of Wildswinkel (Pty) Ltd., which ran the auction. Bellingham said that the four investors in Horizon will put 40 cows – ten per investor – with the bull with each investor keeping the offspring of their cows. Du Toit would like to have Horizon remain on his farm. Breeders in South Africa, the biggest market for such animals, are willing to pay record prices for the genes of buffaloes they believe can increase their herd’s horn span, which is desirable to hunters [sic]. Buffalo breeding is part science, part experience, says Malan. In females breeders look for characteristics such as good horn length, enough milk and regular calving intervals, while for males indications include horn size, body mass and shape. That know-how is complemented with DNA testing to prevent inbreeding [sic] as well as identifying strong breeding lines. Diseases are among Malan’s greatest concerns, so new buffalo must be inspected by a vet before they are introduced to his property, while his staff regularly usher game into bomas where they are dipped to kill ticks which can carry disease. Breeding high-value Cape buffalo has become an intricate business – breeding partners have to be carefully selected to get the best return on investment, the animals are fed a special diet and are microchipped. Just the insurance alone on a single animal can run into astronomical figures each month. Incidentally, Horizon’s sale bucks the recent trend for wild animal prices in South Africa. Average buffalo prices, including females, dropped 30 percent in 2015, according to data compiled by South Africa’s North West University. Prices of sable and roan antelope, dropped 35 percent and 39 percent respectively. In April 2012 Jacques Malan sold Horizon at an age of 4 years and 10-month bull for R26m. Horns measured then at 51 and three-eighth inches (130.5 cm) with a boss of 16 inches (nearly 41 cm) to Piet du Toit in partnership with Norman Adami and Ben Botha. Reportedly the cost relocating Horizon to Du Toit’s farm was about R1 million. 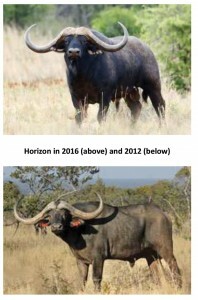 Editor’s Note: The South African buffalo breeders have not yet provided conclusive information on how much a “hunter” would be prepared to pay for a set of outsized Cape buffalo horns, or if there are many, if any, hunters who will shell out massive sums for the debatable experience of “hunting” a former stud bull in a bogus hunting scenario. For the sake of historic accuracy please note that the famed Rowland Ward Records of Big Game (Africa) which published the first book in 1892 lists only 2 buffalo bulls from Tanzania with a spread exceeding 60 inch and 92 bulls with a spread of 50 to 59 7/8 inches in over 700 recorded specimens (24th Edition 2014). Editor’s Note: There are indeed some problems with wild Cape buffalo hunting in as much as many pre-breeding bulls or breeding bulls have been hunted from herds. This problem has been recognized years ago and was described in various articles in African Indaba. Please check African Indaba (list at the end of this article) for further background material. We state, however, that we haven’t heard of so-called superior bulls of South Africa being released into the wilds of Tanzania, Zambia, or for that matter into extensive game ranches with large predator presence in South Africa to enhance the gene pool of the resident wild herds.